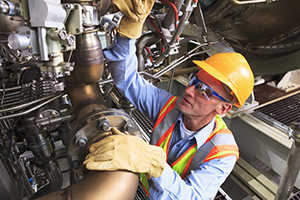 Well-executed machine maintenance helps minimize accidents, reduce downtime, and save money. It’s important to remember that no matter what type of maintenance is taking place, precautions must be made to ensure the safety of the person carrying it out. Maintenance procedures must be developed for all equipment, and should follow manufacturer recommendations. Maintenance workers must be trained on the equipment they’re working on. Maintenance activities should be properly planned out, even emergency repairs. All sources of electrical power to the equipment must be disconnected and tagged “OFF” to ensure the power is not turned on while work is being completed. The machine under repair must also be isolated from all others on the same system, and a proper lockout/tagout device must be employed. Maintenance workers must be properly protected with safety equipment, including gloves, eye protection, and hard hats. Any safety devices (machine guards, shields, etc.) removed during maintenance must be reinstalled before maintenance is complete. Before the machine is put back into service, repair work should be inspected by a supervisor familiar with the equipment. This will ensure the maintenance is complete and the equipment has been properly reassembled.